I say this because the new Google algorithm identifies sites with extreme political views and denies search engine access. Search engine access is the Hawks one great strength against tremendous odds. You guys are going to throw that away, if you haven't already. It's a valid concern Rick. But the thing that really hurts us with Google is that Jack Axaopoulos (sg) has black balled us on hanggliding.org. It's my understanding that Google looks at popular sites and uses them as "approvers" of other sites. Since Jack Axaopoulos has forbidden any links at all to the US Hawks, Google sees the US Hawks as being of very low importance since it doesn't even appear one time on hanggliding.org. Of course Jack knows that, and that's why he's so iron fisted about that rule (even writing software to automatically change people's posts). I'm hoping Google might wake up some day and recognize Jack's predatory behavior and punish him severely. But I'm not holding my breath. I'm also hoping that the word will get around about how Jack Axaopoulos is hurting hang gliding with his stupid little retaliation and people will abandon that iron curtain site. But again, I'm not holding my breath. If you think it's an important issue, bring it up as a topic for the board. I would lean toward our current policy, but I might get out voted. The current policy recognizes that the U.S. Hawks is an association dedicated to recreational hang gliding. A provision for off-topic posts has been provided in the Free Speech forum. I don't see any reason to take that to the board. It seems like good policy - if it is enforced. Rick Masters wrote: The current policy recognizes that the U.S. Hawks is an association dedicated to recreational hang gliding. That's a U.S. Hawks policy - for U.S. Hawks portions of the forum. Chapters make their own policies for their portions of the forum. It should be a Board decision that a particular Chapters policies are abusing that freedom. That's another area where we differ from USHPA. USHPA simply refused to renew the Torrey Hawks chapter at the administrative level. There was no vote of the Board and no reason was given. They just did it. We don't want to go down that road. I believe that quote is very important to our mission. Each of us can be the voice that breaks the trance that USHPA has cast over our sport. Thanks Warren for posting that quote, and thanks Rick for causing me to read it more carefully. Rick should note that the extreme political views that upset him so much were posted 2012. He should be more upset about what google has devolved into since then. Sorry the times have changed and we are increasingly punished for our thoughts and words, Rick. The broken Dragonfly picture was a test. I'll post more about it later from the library that is now closing this Saturday evening. He set a record for consecutive loops in a hang glider. My goal is that none of us should be upset with each other. We are the small few who can see what has gone so clearly wrong with the sport we love and share. We are too small and too few to be letting anything divide us. Please ... if you give a rat's behind about saving hang gliding, let's work together on this one small little problem in the world. It's great to have both of you on board. Thanks. 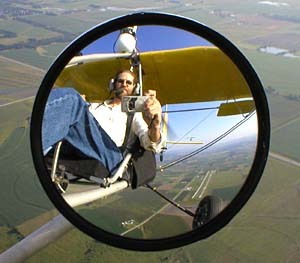 Rick Masters wrote: He set a record for consecutive loops in a hang glider. The picture of the flipped Dragonfly isn't what or who you are thinking, Rick. 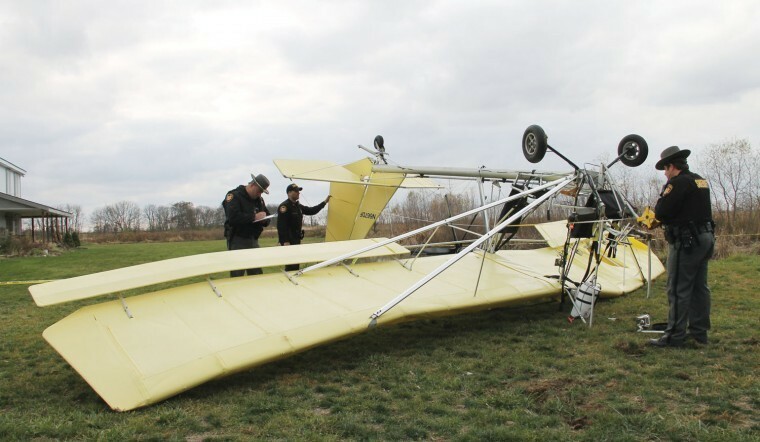 As far as I know, no one was seriously injured in this Kansas City hang gliding crash. Rick, You were thinking of Chad Elchin, of 95 consecutive loop fame. Chad died flying an improperly assembled Dragonfly at Quest hang gliding flight park in 2003. I met Chad 2 years earlier in Florida where he was considerate enough to help set up my enclosed trailer for Dragonfly transport. Very quiet, classy guy. So sorry to hear what happened to him. on that same trip, April 2001.